Many people go crazy when it comes to finding the right paddle board. However, not many pay as much attention to the paddles. To make sure that your paddling experience is superior, you may want to look for the best paddle board paddles – and this guide will help you with your research. Why Do You Need a New Paddle? If you already bought a paddle board, you may have already received a paddle – which is why you are wondering now: why you should pay more for another paddle when this one should work just fine? Well, the theory is all nice; however, while the paddles that are included in the package are indeed functional, they also tend to be heavy and cheap. Plus, they don’t float – so if you drop them in the water, that’s the end of the story. This is precisely why you may want to update your paddleboard – especially if you are a beginner. 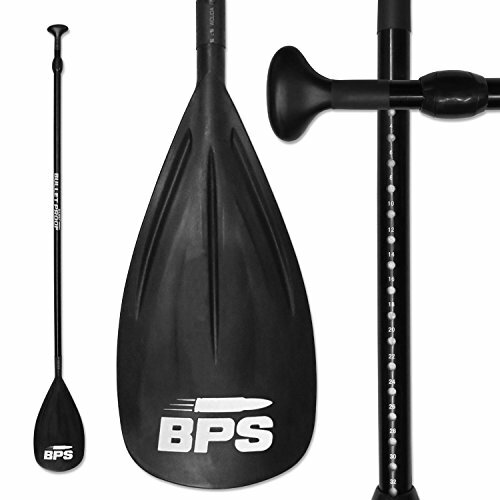 Since you are learning the basics of paddle boarding, you need tools that will allow you actually to learn the waters. When it comes to choosing the material for your paddle, you have several choices at hand – and each of them has its own limitations and benefits. Carbon fiber is very strong while still being lightweight – which comes in very handy if you are part of a competition or have to stay in the water for a longer time. They are also fairly tough and can withstand the abuse of pushing obstacles away. Used for both blades and shafts, fiberglass is a bit heavier than carbon – but a lot cheaper. It’s a good material if you are looking for intermediate-level paddles. Aluminum is a great option for beginners since it is the cheapest of them all. Plus, it’s relatively light in weight. Used either for the blade or for the entire paddle, wood is a bit heavier than the other materials – but still reasonably lightweight. It’s also pretty to look at and works great as presents. Like aluminum, this is another budget option. The disadvantage, however, is that it is a bit heavier than the other materials. It is recommended that you choose the fabric of the material based on your level of performance. What Should the Ideal Length Be? Another crucial aspect of picking the best paddle is paying close attention to its size. If the paddle is too long, you’ll end up holding it too high, and your arms will tire. On the other hand, if it’s too short, you’ll have to bend to reach the water, which will put a lot of stress on your back. The length of the paddle should be chosen depending on the paddling type that you intend to go for. For example, if you want to go paddleboard racing, you should go for a paddle that is 10 to 12 inches taller than you. Flatwater cruises, on the other hand, require paddles that are only 8 to 10 inches taller. And lastly, if you want to go surfing, a paddle that is 6 or 8 inches taller should work just fine for you. 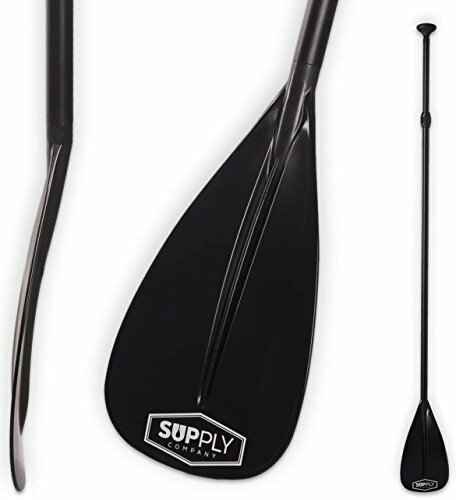 If you practice multiple water sports and don’t want to spend too much money (or space) on multiple paddles, you can go for a paddle with an adjustable shaft. Keep in mind, however, that adjustable paddles are generally heavier than the simple ones. A paddle that is custom-fit is the best that you could go for. They are generally the lightest – and definitely the less complicated ones to use. What Is the Ideal Blade Shape, Size, and Angle? The blade is also a very important feature when picking up the best paddle board paddles. It is the thing that offers us momentum and acceleration – each size being completely different in features. Small blades: For paddlers that are beginners or less fit. Medium, squared blade: Best for racing and speed-giving. Large, rounded blade: Best for waters with large waves or paddles with more strength and experience. The power stroke begins further, allowing you to paddle further much easier. The angle allows for a better water flow, which permits the paddler to glide through. It offers a better water drain so that you won’t lift water along with the paddle. Most of the time, the angle of the paddle is a matter of personal preferences. If you are not sure which one works best for you, you might want to stick with the classic 10% angle. What Are the Differences between Dihedral and Flat Paddle Blades? Flutter happens when the blade doesn’t return during the power stroke. In these instances, the blade may start rocking or wobbling, since it doesn’t have the power to prevent said flutter. The dihedral shape allows you to cut the water more smoothly, enabling the paddle to return. The downside of dihedral blades is that while you may reduce the flutter, you may also lose some power from the stroke. Other paddlers also reported that it’s much more difficult to turn the board into a dihedral pedal. This can be especially inconvenient if you need to make a sudden turn to catch a wave while surfing. This is why dihedral paddles are mostly recommended for beginners who prefer to sacrifice some power and replace it with a smoother stroke. On the other hand, if you are an advanced paddler and flutter is no issue to you, then you can go with the flat blade. You can also watch the video above to discover more tips on choosing the right paddle. 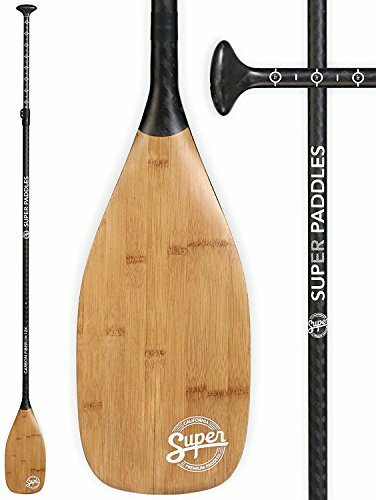 If you are a beginner, the SUP Supply paddle should be a very good choice for you. Made from alloy, it not only brings the paddle in the “affordable zone,” but it also makes it very lightweight. Even when we have to go bigger distances over the water, there would not be any problems with the lifting, nor would there be any “tired hand syndrome” – at least not because of the paddle. For the money, the construction of this paddle is very decent. It’s adjustable so that it can be used by different-sized family members – or, say if your short best friend comes for a visit. The adjusting process is smooth, and once you click it into place, it will stay that way. Last but not least, this is one of the best SUP paddles because it FLOATS! If you get thrown off from your board, the chance of you losing it in the waters is very unlikely. Those looking for an affordable paddle board paddle might find the BPS (BulletProof Surf) alloy paddle a very attractive option. Plus, thanks to its nylon composite blade and aluminum shaft, this paddle is very lightweight. It might not be the best in the batch, but considering the price, it’s a very good choice. This paddle can be adjusted to more heights, so more family members or friends can use it. It can go from 71 to 83 inches, which is fairly good for a tall paddle boarder. This product also comes with a blade cover, so it doesn’t get damaged during transportation. If you are thrown off your board, this paddle also floats. This is thanks to the paddle shaft that has a foam core, making it stay above in both saltwater and freshwater. This is a paddle that was meant for ultimate performance, thanks to its carbon fiber shaft and nylon blades. The Super Paddles construction is tough but very lightweight – even more lightweight than alloy paddles. Plus, thanks to this same tough construction and smart use of durable materials, this paddle can withstand a lot of abuse. Furthermore, this item is easily adjustable to fit every paddler size. It can easily go from 72 to 86 inches, making it perfect even for taller individuals. It’s also very easy to assemble if you are in a hurry. You’ll only need 20 seconds, and you’ll be good to go. 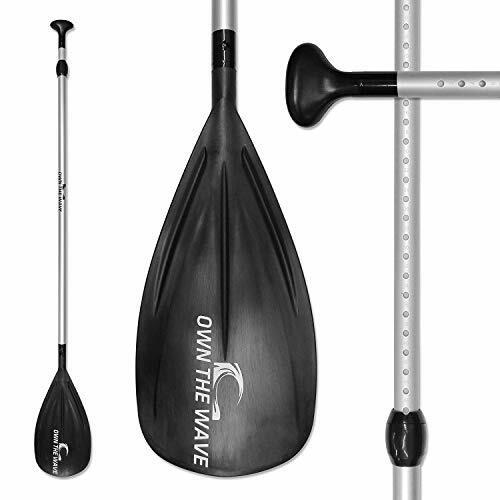 Thanks to its tough nylon composite blade and aluminum shaft, the Own the Wave paddle weighs only 2.2 pounds, making it a very comfortable and lightweight choice, regardless of your level of experience. You can adjust this paddle depending on your height, and it can easily go from 71 inches to 83. All you have to do is secure the pin in the hole that you want, and it will stay there that way. Since this paddle has a foam core, it floats when you drop it in the water. The paddle’s end is also slightly bent, which makes the strokes smoother and more efficient. While these paddles may not be as lightweight as the carbon version Super Paddles, they are still great, considering the price that you can buy them at. Plus, since the blade is made from tough nylon, it can easily withstand a lot of abuse as you are going through the obstacles. Since it has a foam core, this paddle will 100% float if it hits the water. It will no longer sink to the bottom of the lake/river, causing you to dive or even lose a good paddle because of this. The length can also be adjusted from 72 to 86 inches – making it perfect even for those who are nearly 6 feet tall. The design has also been perfected to suit both beginners and professionals, and it can be easily assembled in less than 15 seconds. If you're trying to get serious about paddle boarding, you need to upgrade from that starter paddle. The best paddle board paddle is easier on your arms and gives you better control of your board. Make sure to get the paddle that will fit your style best. You can choose from various materials and styles, but you need to get one that is a perfect match for your height.